Be aware there is a possibility that water damage could be uncovered when flooring or walls are removed; it is a common problem in bathrooms. Be prepared for this possibility and have contingency budget for this. If your contractors don’t encounter any water damage, consider it a bonus! If you have the room, consider putting the toilet in its own little room – sometimes a wall can be added without moving the toilet plumbing, which is a nice budget saver. Hiding the toilet makes the bathroom more usable and is fast becoming “the way” to design a new bathroom. Select appropriate surfaces for a room that, let’s face it, encounters a great deal of moisture. The right surface is easy to clean, does not absorb moisture and is mildew resistant. Porcelain tiles are popular; granite, quartz and engineered solid surface materials make excellent countertops and backsplashes. How often do you use the bath tub? Most people find they are mostly shower-people. If that is you, splurging on the biggest shower you can comfortably fit into your bathroom will be something to enjoy for years to come. A 4 by 6 foot shower with tiled walls and frameless glass door will give the bathroom a luxurious feel. Have water saving fixtures installed; these have been engineered to provide the same feel and usability as the old water wasting fixtures. Be sure to provide enough light and ventilation. Damp, moist bathrooms need efficient, (and quiet) exhaust fans. Working from a set of detailed plans helps ensure workers stay efficient, the homeowner stays informed and the new work blends with pre-existing features. Toilets, for example, by code have to have a certain minimum clearance around them; having a good set of plans makes certain this space is there! It helps if you have another bathroom while the bath remodel is being done, but if you don’t, maybe you should add one first! Finally, be sure to hire skilled, experienced workers to build your project. Check references, licenses and insurance. Then go for it! 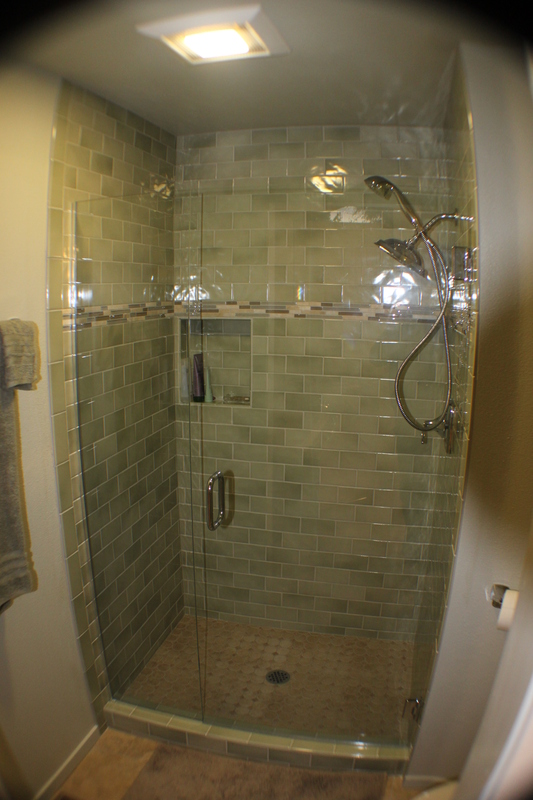 A tiled shower, frameless glass door and hand shower compliment this bath remodel.